Click here for a copy of the presentation! Butzel Long, in partnership with OESA and DBusiness, would like to invite you to attend the Butzel Long Connected Car Symposium. The connected and autonomous vehicle innovation is perhaps the most meaningful and fast paced modern-day development in the automotive industry. Along with innovation comes a lot of uncharted territory. 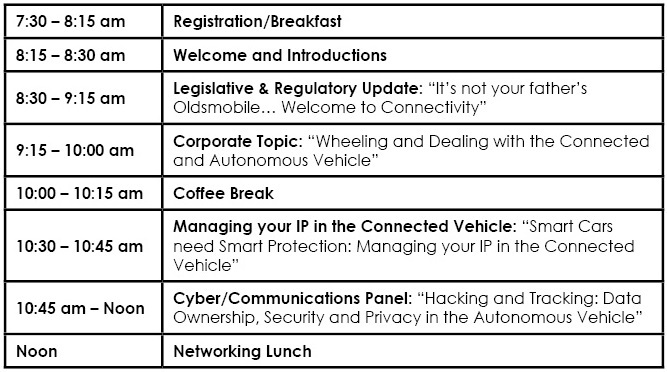 The Butzel Long Connected Car Symposium will navigate some of that territory by presenting expert insight on topics including Intellectual Property, Deal Making, Contractual Issues, Regulatory and Legislative Developments, Hacking and Tracking, Data Ownership, and Privacy Issues. In addition to substantive programming, opportunities for networking and group discussion will also be provided. We look forward to having you join us!